Scotmid Co-operative’s ground-breaking project to install defibrillators in many of its stores has won a national industry award. 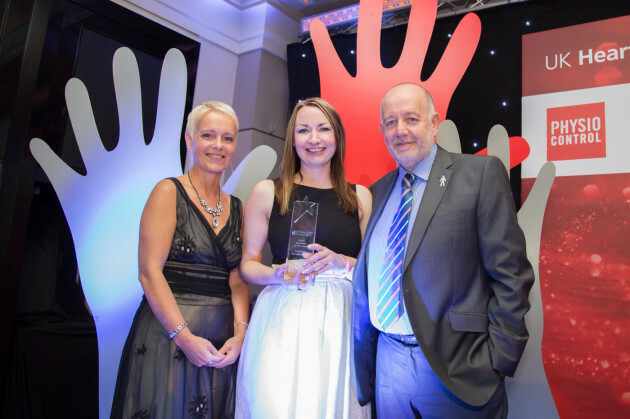 Scotmid won the retail business of the year category at the UK Heart Safe Awards 2014, held by the Hand on Heart Charity in Manchester on 2 October 2014. The UK Heart Safe Awards celebrate organisations who invest in creating heart safe environments, by providing defibrillators and staff training to save the life of a person suffering from a cardiac arrest. Scotmid was praised by judges for being the first UK retailer to install defibrillators into a large number of its stores. The retailer has been working with the Scottish Ambulance Service since 2011 to bring defibrillators to communities where they are most needed, such as remote areas and places of high cardiac arrest. Scotmid has installed defibrillators in over 40 locations across Scotland and the North of England, and invested in a comprehensive training programme for over 250 staff. A defibrillator is a life-saving machine that gives the heart an electric shock to restart during cardiac arrest. Acting quickly when someone is in cardiac arrest is crucially important – every minute without CPR and defibrillation reduces survival by 10%. A defibrillator can increase the chance of survival by 50%. Hand on Heart aims to put defibrillators into schools all over the UK and has provided 400 fully funded defibrillator packages since the charity began in 2010. Children are at high risk of cardiac arrest because their hearts are still developing and any excessive strain can trigger an attack.